Our exclusive small groups journey across Thailand offers diverse, wondrous and unique experiences, covering royal culture in vibrant Bangkok, art and adventures in the mountainous northern regions and island life in the idyllic tropical south – capturing the very soul of this amazing country. Thailand’s capital, Bangkok, ranks as one of the world’s top tourist destinations, besides one of the world’s finest food capitals. Few international cities such as Bangkok can seamlessly balance east meets west and tradition and modernity. We take a guided tour through one of this City of Angels’ most significant and spectacular landmarks, the Royal Grand Palace. After relocating the capital from Thonburi to Bangkok, King Rama I began construction here in 1782. The magnificent 94 hectares (233ac) palace grounds encompass more than 100 buildings, including the Royal Residence, Throne Halls, government offices and those used for ceremonial occasions. Within the grounds, we also visit Wat Phra Kaew, home to Thailand’s most revered Buddha Image, the Emerald Buddha and Her Majesty Queen Sirikit’s Museum of Textiles. This state-of-the-art textiles museum contains Thailand’s first dedicated textile conservation laboratory and Queen Sirikit’s personal costume collection. After arriving in Chiang Rai, in Thailand’s northernmost province, we transfer to our luxurious Tented Camp for an amazing two-night adventure deep in the Golden Triangle. This five-star hotel-camp is embedded in bamboo jungle, close to where the Ruak and Mekong rivers converge, surrounded by mist-shrouded mountains. 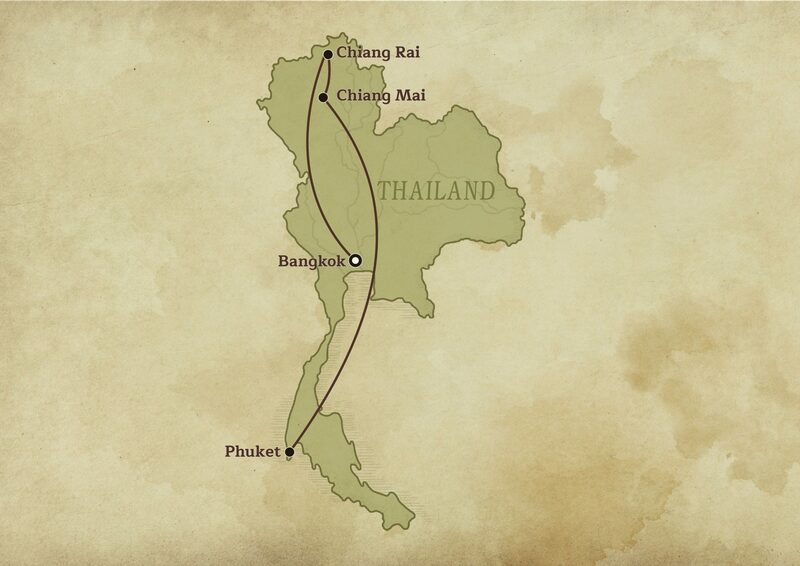 As this is Golden Triangle terrain, the camp overlooks Myanmar, Thailand and Laos simultaneously. Along with a spectacular, unspoiled landscape, the Golden Triangle region bears a notorious history as formerly one of the world’s most prolific opium-producing regions. Various Thai organisations have spent decades battling this illicit trade. Nowadays, this naturally beautiful, mountainous region, home to dozens of hill-tribe villages, is a popular and peaceful tourist destination. Activities include Mahout training and unique experiences with rescued elephants at the elephant camp and guided excursions in the Golden Triangle on long tail boats. Or simply relaxing in the luxury tented accommodations –reminiscent of 19th century adventure expeditions. 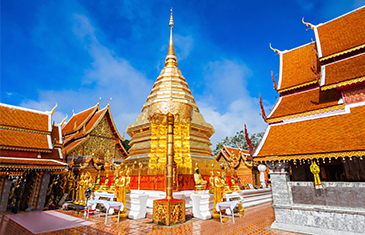 Surrounded by mountains, Chiang Mai is northern Thailand’s hub, a charming ‘Rose of the North’ that was theformer seat of ancient Lanna Kingdom. Rising at dawn, we drive westwards past spectacular mountain scenery, for Doi Suthep Mountain. Witness dozens of monks streaming down the 1,676m (5498ft)-high mountain to Chiang Mai, for the Buddhist living ritual of receiving alms. Continue to mountainside Wat Phra That Doi Suthep, a stunning temple complex, founded in 1383 to enshrine a bone shard relic from the Buddha’s shoulder. 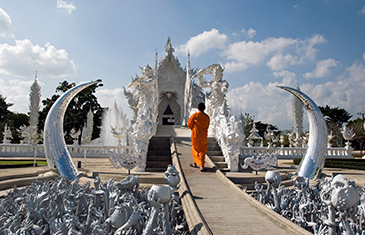 One of Northern Thailand’s most sacred temples isaccessed by climbing 309 steps (a cable car is also available). Later, participate in a hands-on Thai cooking classwith a celebrity local chef at his private countryside farmhouse and organic farm. Learn to create authentic Thai curry, later sampled for dinner. Join an exclusive guided art tour at Chiang Mai National Museum with an internationally renowned Professor. 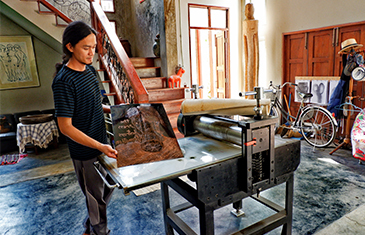 Our esteemed guide, an artist himself and former Dean of Chiang Mai University, works tirelessly to promote northern Thailand’s arts scene. 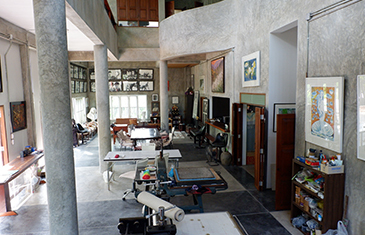 Through in-depth conversations with the professor, we get a rare opportunity to learn about Chiang Mai’s contemporary arts, plus the history of ancient Lanna arts. One of several excellent museums in Chiang Mai, the National Museum is Chiang Mai’s oldest, but recently underwent a modern refurbishment. The museum presents a succinct outline of the northern city’s history from prehistoric times. First-hand insightfulness on our bespoke tour continues at Chiang Mai University’s Centre for the Promotion of Arts and Culture, a living museum presenting Lanna culture and heritage. Located in the sparkling Andaman Sea in Thailand’s south, Phuket is Thailand’s largest island, ringed by limestone karst islands and white sand beaches. This ‘Pearl of the South’ offers the perfect blend of natural beauty and rich island heritage. Depart early by speedboat for an amazing day at idyllic Phi Phi Islands, a spectacular clusters of islands set amongstkarsts rising up in Phang Nga Bay’s emerald-green waters. The epitome of paradise tropical islands, Koh Phi-Phi Don and Koh Phi-Phi Leh, collectively known as Ko Phi-Phi, are hugely popular for their stunning bleached white beaches, jungle interiors, coral reefs and crystal-clear waters. To avoid the crowds, our first stop is Bamboo Island,for a refreshing swim, then snorkelling at Yoong Island, noted forits antler corals and colourful fish. Enjoy a simple buffet lunch on Koh Phi Phi Don,before taking a dip atViking Cave on the island’s northeastern tip. Our final day is free at leisure. Your five-star resort is locatedalong Phuket’s popular southwestern coastline in a picturesque bay, boasting one of the last remaining secluded beaches on the island. Hidden away amid mountainous headland and verdant beachfront forest, relax at your tranquil, island escape. Authentic experiences of the island’s rich cultural heritage and historic Old Town are within easy reach. You are also perfectly placed for memorable explorations by boat around the Andaman Sea. Snorkel or dive amid colourful coral reefs and tropical marine life in warm azure waters, in some of the world’s most stunning dive sites. Transfer to Phuket International Airportfor your onward flight.